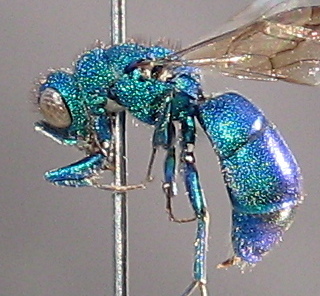 Chrysura Pacifica also known as the pacific "cuckoo wasp" belongs to the family of Chrysididae, in the order Hymenoptera. The scientific name of the family comes from the greek word krusòs meaning gold, because of the metallic-golden reflections of their body.The common name cuckoo wasp refers to the cuckoo birds they resemble that lay their eggs in nests of other birds. These brilliantly colored wasps are known for there parisitism or cleptoparasites on larva of other insects, wasps and sawflies especially. usually spotted because of its brilliant colors, In the Western Hemisphere most chrysidids are metallic blue, green, and purple, in various combinations.Though it's not easy to see because of its miniture size. It shape is variable according to species, particularly in size, and in its length from 5.0 to 8.0 mm may be a reflection of size differences among the several host species. Furthermore, the impact of the above interference colors is intensified by the dramatic sculpture common in the family: polished integument, coarse punctation, and sharp carinae. Another morphological Identification is in the segmentation of abdominal segments, male with four well developed external abdominal segments, females with three. In additon to this each wasp is equiped with a dorsally located groove that it can use to roll into a ball for protection purposes and also a modified stinger homologous to an ovipositor protrudes from the abdomen. Chrysura pacifica is the most common and widespread species of chrysididae in the U.S..Distribution is wide through the transcontinental, U.S. and Canada, ranging in the west from Alaska to the Sierra San Pedro Martir mountains in Baja California. Habitats are mostly common from Upper Sonoran and Upper Austral to Canadian Life Zones. A few records are from Lower Sonoran and Hudsonian Life Zones in California. Chrysidids are solitary wasps and in their life they are strictly linked to other solitary wasps (Sphecids, Apids, etc. ), with whom they share the same environments. Generally chrysisidids live in micro-habitats such as flowers, arid and sandy soils, old woods exposed to the sun, rocks or pebbles, infested plants, etc. chrysidids tend to like subtropical-Mediterranean climates, with warm dried summery atmospheres where they can stay insolated.In these microhabitats is where a good portion of their rest and parisitoid activities take place. chrysidids will generally be spotted near disturbed areas,inhabited areas by other wasps, or near worm-holes in wood searching for nests. There are two basic host stages attacked by chrysidids. Most species studied oviposit on, or adjacent to, the host prepupa. The egg hatches immediately and the resulting larva consumes the host and provisions, or the larva attaches to the host and only begins to feed when the host molts to the prepupal stage.Major behavioural and structural changes have occurred in the Chrysidinae. These wasps, with one exception, (Praestochrysis) are nest parasites of wasps and bees. They actively enter nests, whether the host is present or not. if the adult host is a capable fighter, equipped with powerful mandibles and sting. chrysidine morphology allows them to roll up into an impenetrable ball if they happen to be attacked by the host.Chrysidine females penetrate the host cell and either oviposit directly on the host or elsewhere within the cell, this behavior varies and can take place with some complexity. This page was last modified on 6 June 2010, at 22:47.